Both the House Chamber's architecture Congressmen's manners were disected in an 1836 article in Magasin Pittoresque, a popular 19th century French illustrated periodical. 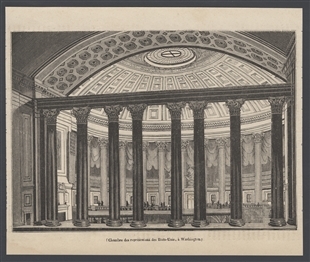 The print shows the House Chamber—now Statuary Hall—to dramatic advantage, including the lofty dome and rows of columns described in the accompanying article. 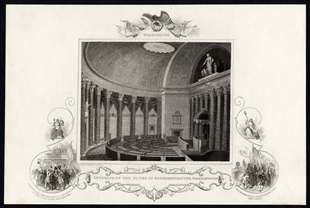 The magazine points out, though, that the Chamber is a rare example of Americans sacrificing “usefulness for beauty,” as the acoustics of the room did not allow one to “hear the orators without paying the most tiresome attention.” Members’ propensity to prop their feet on their desks was also noted, as it often was in the more urbane press outlets.